We came back recently from a family trip to Yosemite. 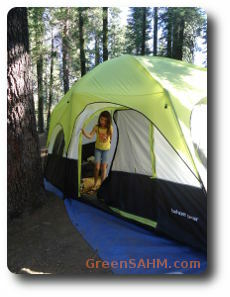 5 days, 4 nights of camping in Crane Flat with three kids and my husband. It’s not everyone’s ideal vacation, but considering that the trip covered both my birthday and my wedding anniversary, I think you can safely say I enjoy it. So did my husband and our kids. There’s a lot to be said for taking children camping. One of the big things kids get from camping is an added appreciation for nature. Mine already enjoy hiking, but it had been too long since we had gone camping with them. Hadn’t taken the youngest at all yet. In Yosemite, they were able to see a wider range of what nature has to offer. This was the first time they ever saw a chipmunk, although they’re plenty familiar with squirrels. They saw deer in a meadow and deer up close when the deer wandered by Curry Village’s dining area. They also got to climb really big rocks. My oldest wanted to climb Lembert Dome, but not on the path, so she only made it up part of the way. 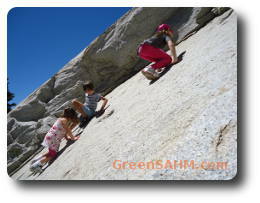 Now she wants to be a professional rock climber (as well as at least a half dozen other things). We also were able to see firsthand how much the current drought is affecting Yosemite. 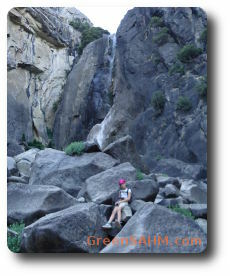 Yosemite Falls, usually still a great waterfall to see this time of year, was barely a trickle. On the other hand, the kids had a grand time climbing around the rocks at the bottom, which are usually too wet to be safe. Getting comfortable with nature is important to children. I’ve recommended Last Child in the Woods before, and I still do. 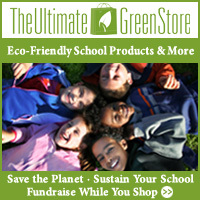 Getting children out into nature beyond backyards and playgrounds is very healthy for them… and their parents. 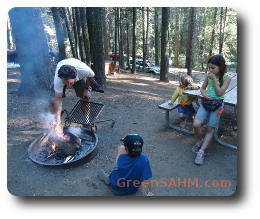 Camping is also a great time to talk about respecting nature and taking care of it. Yosemite, for example, is very strict about the use of bear boxes for anything which might attract bears to your campsite. It’s the perfect excuse to talk about how our behavior can hurt animals. I’m a firm believer in dirt. I don’t stress about things getting a little dirty, especially in places where there’s little choice in the matter. It made for quite the laundry pile when we got home, and some challenging stains, but it was certainly worth it. There’s a theory that getting dirty may be good for the immune system. Basically, it’s the small exposures to germs over time that help your immune system become strong. It makes sense to me, and so I enjoy it when the kids get dirty. No one gets to use electronic toys when we go camping. I had my iPad along, but only for music in the car on long drives. It didn’t come on hikes and it didn’t get used in the evenings while we sat around the campfire. Yes, my kids were quite frustrated with that rule, although a little less so when I pointed out the lack of internet access. While camping, my kids declared certain areas to be clubhouses, pretended to be pirates, climbed rocks and generally had fun. Children need to be limited in how much they use electronics throughout their day. I know mine do far more interesting things when I tell them to turn all screens off and go play. They interact more with each other and really work their imaginations. Camping is very much an exercise in making do with less than you usually have. There’s only so much food you can put in an ice chest or otherwise keep at your campsite. No microwave, just the campfire or the camp stove to cook meals. Very few toys aside from what natural objects they could find. Everyone sleeping in one (admittedly large) tent at night. I’ll admit there was one experience I could have done without. The bathrooms for our section of the campground were closed and replaced with porta potties. Definitely could have done without that. Sometimes we walked extra to get to the regular bathrooms, but when a three year old says she has to go, that’s usually right NOW, not five minute from now. Then again, porta potties are far better than nothing. My oldest was fortunate enough to meet a girl a little younger than her at a nearby campsite. Instant friendship, and we’ll see if it sticks over time or not, as they exchanged phone numbers. They spent mornings and evenings playing whenever they had the chance. Camping is a great time to meet people you’d never know otherwise. We had camp neighbors from a few other countries, as well as people from more local areas. Yosemite is of course a huge attraction to people all around the world, so you never know where the people you meet have come from until you start talking. Camping was great for ensuring lots of family time. We were pretty much always together, sharing experiences and having fun as a family. No one had to go to work or school, no one was distracted by the television or other electronics. I only got one cell phone call, and that was an auto-dialed call by some company talking about diabetes, so an easy hangup. Camping means a lot of exercise. Most of what you do takes more physical effort than it would at home, plus you’re likely to go hiking, swimming or do some other physical activity during the day. We didn’t get to hike quite as much as my husband would have liked, but there’s a limit to how much a three year old will hike, especially in the hot weather we had during our trip. Still, it was all great exercise. Kids don’t necessarily get to do much around fires at home very often, but when camping, fire is something they just have to deal with… at least if that’s how you keep warm and prepare your food. My kids had so much fun finding little bits of wood to add to the fire, and were awed by how my husband handled the firewood barehanded. Of course, that made the lesson a little more challenging in some ways. While fire is dangerous and burns are painful, I believe it’s a good thing for children to learn how to deal with fire, most especially how to respect it. Dealing with it in circumstances less controlled than the burner on a kitchen stove gives them that chance, whether it’s figuring out just how close they can get a marshmallow to the flame without catching it on fire (or having to blow one out), or seeing how quickly different things burns. Overall, this was a really wonderful camping trip for us. I’ve told my husband we need to plan more camping trips each year. We’re thinking at least two bigger trips each summer, plus weekends when we can manage it. Because we didn’t get to Mariposa Grove in Yosemite, we’re thinking one trip next year will be Sequoia National Park, as the kids really want to see some redwoods.